Approximate weights, small to large: #14 = 1/60 oz., #12 = 1/50 oz. & #10 = 1/32 oz. This monster 10 1/4" Bluegill was taken on the Madison chain by Joe Puccio on a #14 Panfish Cobra using the "Kabob" style rigging. The big Gill was released after the photo was taken. Equipment: 7' Light or Medium Light Action rod, spinning reel with 6lb test Fireline Crystal & most important is the invisible 12" 4# Flouocarbon leader that is tied direct to the jig. Bait: Live bait or Gulp, always rig grubs and spikes "Kabob" style. 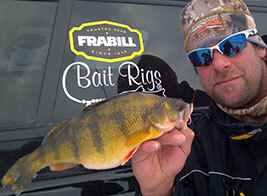 14.5" Perch caught through the Ice on the Bait Rigs Panfish Cobra Jig by John Stutz. John tipped the jig with a plastic spike. The SS-53 Panfish Cobra Open Water Kit is the perfect assortment of Cobra jigs for Spring, Summer and Fall. The kit features (3) sizes of Cobra Jigs, #14, #12 & #10 to be used with worms, grubs, Minnows and Gulp Alive for Bluegills, Crappies, Perch, White Bass and Smallmouth. All Cobra's feature a unique offset Mustad, Kahle style hook that has no equal it its ability to hook and hold light biting and hard fighting fish. A must have jig for the serious Panfish angler. Testimonial from Mark Romanack with Fishing 411. 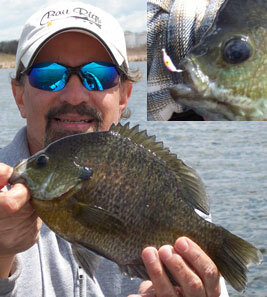 "Cold Spring and Fall tactics payoff for monster Bluegills. Think small as fish are cold and prefer smaller offerings. I use a #14 Panfish Cobra tipped with one wax worm rigged "kabob" style. This presentation is both small and compact, forcing light biting Gills to move up on the bait, resulting in better hookups." Testimonial from Jeff Simpson of In-Fisherman Magazine. "I used Bait Rigs Panfish Cobra Jig last season and rarely missed due to the Mustad offset hook featured on the jig-one of the Best for consistently hooking fish."